She’s a drama queen (in more ways than one) but she used to be shy and introverted. She’s mean (but only after 10pm). She’s super smart but scared of tests. She’s self destructive and she’s self-controlled. For this edition of essai files, we had to try to get to the bottom of who ‘Ananya’ really is. Essai: We have been waiting for this interview for so long Ananya! You’re one of our longest-term students, and everyone in the office is super proud of everything you’ve achieved so far (and are going to go on to achieve). But we’re intrigued by the fact that you describe yourself as ‘drama’. What exactly do you mean? Ananya: I do theatre drama and I do ‘drama’ drama. That’s me. That’s been me since the age of 9. E: Okay so we understand what theatre is, but what’s ‘drama’ drama? A: I have this tendency to turn everything in my life into a huge scene – for me, the minutest incident can become a total breakdown, with tears and worst-case prophecies. My Spanish teacher even reserves 5 minutes at the start of every class for me to cry! E: Is there some connection between the two kinds of drama? When you’re having a very public breakdown then you are demanding the attention of the people around you and putting on a show, and when you’re on stage you are also performing and being the centre of attention. A: I think there probably is: I love being the centre of attention. I think that’s why I got hooked on theatre. My first proper play was Midsummer Night’s Dream, and since then I’ve been in a performance every year. I’m doing Drama HL at school, and I’d love to go into acting, writing, or directing in the future. E: And you’ve always been like this? A: No! It sounds strange to say this but I was actually a very quiet, shy child. E: Getting involved with theatre must have been a real turning point in your life then? A: Yes; now I really can’t stop talking. E: Making up for lost time perhaps? Anyway, another interesting contradiction in your life is the self-control / self-destruct pattern you describe yourself following in your personal and academic activities. How can someone who manages so many extracurriculars and gets such good grades also have a self-sabotaging tendency? A: The kind of stupid things I’ll do include staying up on my phone until 5am when I have a test the next day. My friends have tried to talk me out of it, and I guess I really should try harder to listen to them! But it’s my self control which counter-balances this and enables me to keep up with all of my work despite feeling tired or cramming all my studying in to the last possible minute. E: And what about in your social life? Does this destructive tendency spill into that too? A: I guess part of my ‘mean’ behaviour – gossiping, bitching, judging – is a form of sabotage. Thank god I’ve grown out of the worst of that phase though – now I try to play nice until 10pm, when I allow myself to vent some of my feelings on the phone to my friends. E: Clearly this ‘mean’ personality is something of a façade; you’ve just beaten 3500 applicants to win a Silver Pramerica ‘Spirit of Community Award’ for commitment to your social service project. That’s an incredible achievement! A: Thanks... I started my project by selling homemade candles to fundraise to buy biodegradable sanitary pads for girls from low-income communities. Then when I met the girls, I felt a real sadness and sense of shock at the level of prejudice they were having to deal with every month. I started running education sessions at a local NGO for these girls to speak about sanitation, consent, and sexual health. E: And what was it like going in to try to tackle these prejudices? A: I found it a real challenge to run the education sessions at first because my Hindi is not very good. However, just bringing these ‘forbidden’ topics into an open forum helped to eliminate some of the stigma surrounding them. E: We’ve been following this project since the very start, and we’re so happy to have been able to support you with it. It seems like you are quickly gaining momentum – what are the next steps? A: Mili and the counselling team have been so great – motivating me and helping me to grow the project. I currently work with 3 different NGOs and visit each one once a month with a small team of juniors from school. I’d really like to partner with more NGOs or schools in Delhi, and eventually go to the surrounding villages to run the education sessions. This would mean I’d need to train up some more session leaders in order to expand our reach. E: Something we really can’t leave out of this interview is your coveted title of ‘essai’s best reader’. We’ve never had a student who can read as quickly and answer the questions as accurately as you. Can you share the secrets of your success? A: Well it certainly helped that I liked coming to classes at essai – I was in class with my friends and I enjoyed beating their scores in all the Reading sections – even if math was a different picture. But really, I think that to be a good reader you have to love books, and you have to start young. I’ve been obsessed with books for as long as I can remember – I wasn’t allowed to watch TV as a young child, so books were my source of entertainment, my escapism. I also loved stories – reading them, telling them, writing them. Memorising books was my superpower, and I wanted to be Roald Dahl’s Matilda! E: Reading is a solitary activity; how does this fit with your chattiness and extroversion? A: When I first got in to reading I was in my quiet and shy phase. Fictional characters were my friends; reading allowed me to withdraw from social situations. E: What about the distractions of phones and laptops as you got older? These didn’t replace books as sources of entertainment? A: I go through phases of using my phone too much… It’s easy to get addicted to constant social interaction, especially when everyone else is living in the same virtual bubble. But being online can never bring the same comfort as reading can. I think it’s sad that Delhi has so few good bookshops. Everyone can fall in love with reading if they just find the genre which is right for them. E: Students take note! Ananya might have less than ideal nocturnal phone habits, but she is living proof that if you want to get a good Reading score then you have to actually read. 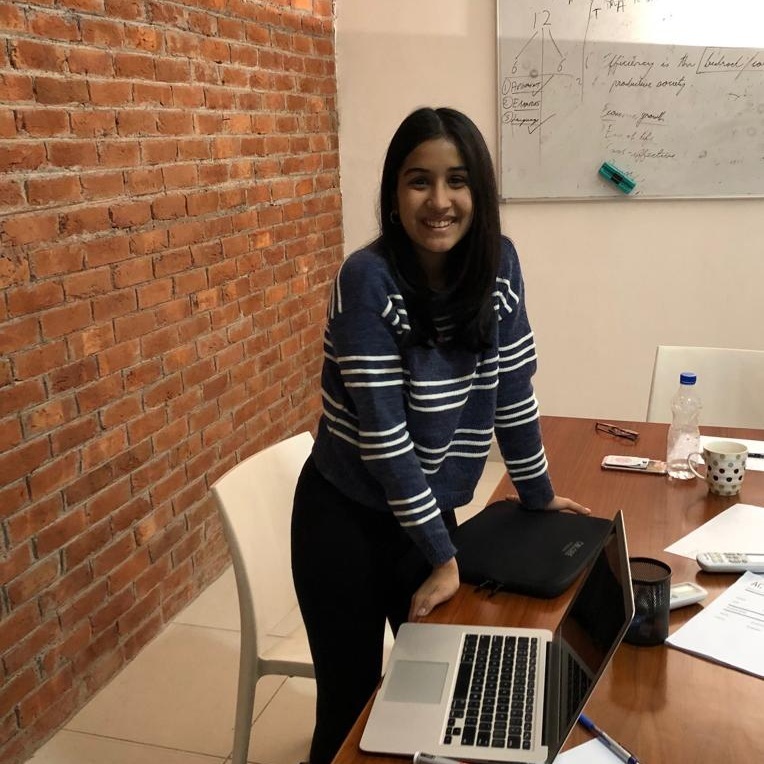 Thanks Ananya for coming and sharing your wisdom with us and for giving us a peek inside the ‘messy wardrobe’ (Ananya’s description!) of your life.